The Independence Day, also known as Jamhuri Day (“Jamhuri” – a Swahili word – which means “Republic”) is one of the most significant national holidays observed in Kenya. Moreover, this is the most widely celebrated festival of Kenyans. Traditionally, the president accompanied by defense forces and government dignitaries gives a speech at Nyayo Stadium of Nairobi. The colorful flag of Kenya can be seen waving in private dwellings, buildings, and everywhere in the capital city of Nairobi. The day is also celebrated by various cultural festivals that reflect Kenya’s distinct cultural identity. Colorful and traditional outfits – Kitenges and Kikoys – are worn by the Kenyans to celebrate this momentous day. Typical Kenyan delicacies – porridge made of maize, Ugali, and mashed vegetables made into balls and soaked into meat stews – are relished. On this day, Kenyan communities usually come together from all over the world and commemorate their heritage of Africa. Independence Day celebrations, therefore, include, political speeches, dancing, feasts, and parades. The national flag of Kenya, combined with historical events that gave a new shape to the country, truly symbolizes the ambitions and aspirations of the country. 12 December 1963 was the day when the Kenyan government officially adopted the national flag. The three horizontal strips of the flag – black, red, and green, respectively from top to bottom – contain a thin stripe of white bordering the top and bottom of the red. Also, the black color of the flag represents the people of Africa, the red color is a symbol of Kenyan struggle for freedom, whereas the green color symbolizes agriculture and natural resources of Kenya. Most importantly, Masai warrior's shield and spears, placed in the center of the flag depicts Kenya's struggle for independence and their prepared state of action to safeguard that freedom. The lyrics and music composition were done by Thomas Kalume, Washington Omondi, Graham Hyslop, George W. Senoga-Zake, and Peter Kibukosya. The people of Kenya through the national song seeks the blessings and special prayers from the Almighty to bless the country and protect it from any foreign assault. Emphasis is given to peace, unity, and liberty not only within the nation, but also with its bordering countries. Thus, in this manner with hard labor and firm resolution the country can reach great heights of success and prosperity in the days to come. There is a feeling among its people that there is much to celebrate as the nation makes its way for a viable economic power and concerted efforts towards shedding a legacy of corruption, violence, and discrimination. 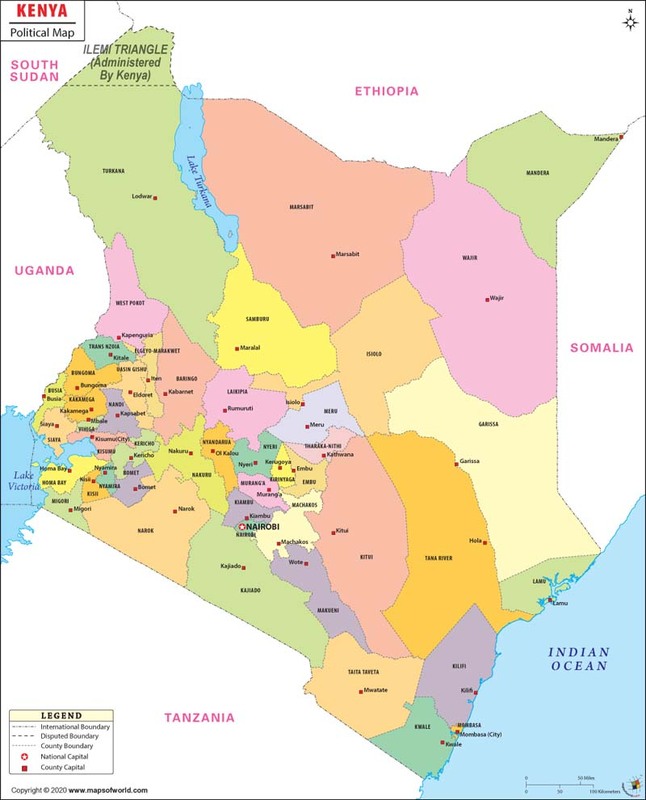 Kenya was officially declared the colony of Britishers in 1920 since the late 19th century British rule. The Africans were denied any political role by the colonial rulers. Dissension over land, traditions, and customs continued and that paved the way for the Mau Mau rebellion in the 1950s. The role of the Kenyan rebel leader, Dedan Kimathi, to fight the British rule cannot be undermined as he was imprisoned and executed in 1957 by the Britishers. The members of Mau Mau, primarily consisted of Kikuyu (the largest ethnic group in Kenya) that launched violent assaults against the colonial raj. In 1952, the nation was plunged in an emergency state and during which many Kenyan freedom fighters were arrested, including Jomo Kenyatta, president of the Kenya African Union. It resulted in widespread detention and the loss of so many lives. Nonetheless, the Mau Mau uprising convinced the British that political, social, and agrarian improvements were needed. Therefore, in 1957, the first direct elections for the native heads to the Legislative Council were allowed by the Britishers. Consequently, by 1960, Africans formed the majority in the council and the day was not far when on 12 December 1963, Kenya acquired complete independence from the colonial rulers with Jomo Kenyatta as the president.